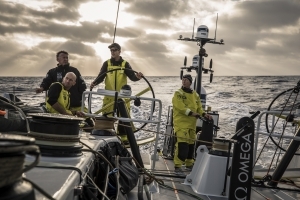 The Volvo Ocean Race finished in June 2018. 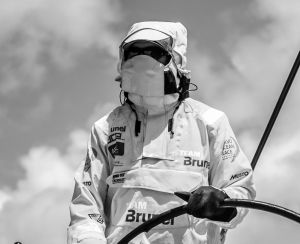 After a nerve-racking battle, Team Brunel finished in a third position. The next race will start in 2021, under a new name: The Ocean Race, in which the V65 Class will take part again. In the preparation for this race we welcome ‘fans and friends’ on board. From the home port of Scheveningen we will make various trips to England and Germany, among others. Step aboard and experience a day you will never forget. On board everyone gets the chance to help; helming, hoisting the sails or surviving at the bow. As a sailor you will enjoy this racing machine. But sailing experience is not necessary to experience a unique day. The experienced crew will gladly show you on board and tell you the tips and tricks of sailing. Especially for companies that are looking for a unique incentive with colleagues or relations, we offer the VO65 with crew. You can opt for a day where you sail several times or with a small group make a long trip at sea. This can also take several days with a night trip, for the real Ocean Race experience. Times can be filled in as requested. Below is the standard programs. Safety briefing on board, hoisting and sailing. Everyone on board get the change the helm the boat and grind the sails. Different times available on request! Safety briefing on board, hoisting sails and a long sailing trip at sea. On board you will make your own food, based on the traditional freeze dried food as in the race. There is time for everyone to helm the boat, grind and help on the bow. Back in the harbour you will have a nice drink at Dierckx & Dierckx. For the real teambuilding or sailing experience we offer a 24 hour offshore trip. You will have the full ocean experience. You sleep on board, helm the boat, change sails, make your own food and enjoy the sunset. Coffee, registration and briefing at Dierckx & Dierckx in Scheveningen. You will get info about the watch system and the life on board. On board you will get a safety briefing and you check your gear, before leaving the harbour. You sail in shifts 4 /4. You are really part of the crew! You make your own meals (freeze dried) and you sleep in the bunks, when sailing. 24 hours later you come back in Scheveningen, with an experience you will never forget! In addition to the charters, there are a number of days / trips planned where you can sign in individually. You will have the change to helm the boat, grind and help the crew at the bow. – afhankelijk van de wind kan de vertrek- of aankomstdata enkele dagen wijzigen. coffee and registration at Dierckx & Dierckx in Scheveningen You are welcomed by the crew Safety briefing on board, hoisting and sailing. For the real experience you can join Team Brunel for a delivery. You will be part of the crew and they need you! You sleep on board when sailing, helm the boat, change sails, make your own food and enjoy the sunset. You will sail from one place to another. The experience crew on board will teach you the life on board, how to sail the VO65 and the navigation. A lifetime experience! Please note: depending on the weather we can change the day and time of departure. A few days before we share the forecast with you and we can give a little indication of the expected timings. JOIN TEAM BRUNEL AND YOU WILL HAVE AN EXPERIENCE YOU WILL NEVER FORGET!